I’ve been to Paris only twice and never went inside Notre Dame. My last trip, in September 2016, I went to the Ile de France and to another church there, St. Chappelle, which is beautiful. But when I got to Notre Dame, there were long lines, and I can’t stand for long without sciatica pain. So I’ve missed all that was burned inside. I did, however, get this photo of the “zero point” from which all distances from Paris are measured. It’s embedded in the flagstones in the large place in front of Notre Dame. Later that day I crossed one of the bridges from the ile to the mainland and saw hundreds of padlocks attached to the railing. “Locking our love” I was told they symbolized. Jack was the true romantic in our relationship, so in honor of him, I bought a padlock and attached it. It’s Slice of Life Tuesday over at Two Writing Teachers. Check out this encouraging and enthusiastic writing community and their slices of life every Tuesday. And add one of your own. About 25 years ago I was in Budapest for a conference. One night I ate at Kispipa, a restaurant the was supposed to be Jewish haute cuisine. (This looks like a common restaurant name, with several still in Budapest, but I can’t tell whether any of them is the one I ate at.) I ordered roast goose, which came with deliciously “steamed cabbage” and something called “onion potatoes” (according to the menu). The goose, the first time I’d ever eaten it, had “the texture of juicy but very well done pot roast,” I wrote in my journal. The cabbage was less steamed, more braised for a very long time, possibly in some stock. I wrote then, “It still had an astringent bit, but it was mellow, not sharp like sauerkraut,” and it was perfect with the rich goose. The potatoes were roughly mashed, just as I make them at home, with tiny bits of onion. The whole meal was delicious. Some months later, back home, I was looking through Marcella Hazan’s “More Classic Italian Cooking,” and saw a recipe for Smothered Green Cabbage, Venetian Style. It was fall, and I wanted some cabbage. It called for very thinly sliced cabbage sauteed with some chopped onion and garlic in a quantity of oil and a dash of wine vinegar, and then cooked very slowly for a long time, an hour to an hour and a half, stirring every 10-15 minutes to mix in the caramelized bits. When I ate it, it brought back the taste of the “steamed cabbage” at Kispipa. I’m thinking the only difference might have been the fat, goose or chicken fat in the Hungarian restaurant, olive oil in the Italian dish. I’ve made this cabbage many times since, and I always slice by hand, since I find that meditative. And a few more notes about that Hungarian dinner. It started with sour cherry soup, covered with dollops of whipped cream. And for my coffee, I asked for cream, which puzzled the waiter until he brought me—a bowl of whipped cream. It’s another year for the essay a week challenge, 52EssaysNextWave. If you’d like to try it, go on over to the Facebook page for 52EssaysNextWave and sign up. Or just read some of the essays that will be linked to there. I'm way behind this year (it's clearly no longer the sixth week of 2019), but going to try to catch up. The other day I went to a genealogy workshop at the Municipal Archives, where I learned what birth, death, and marriage information is available for New York City. I had the marriage certificate for one set of grandparents, but I was also able to find the marriage license, which included information about names and birthplaces of my grandparents' parents. My grandfather's parents were both born in the same city he was born, Vitebsk, in what's now Belarus. My grandmother's mother, however, was born in Vilno aka Vilnius, in what was Russia then and now is Lithuania. Since my grandmother and her father were both born in Lodz, then Russia, now Poland, I wish there were some way of finding out how my great-grandmother got from Vilno to Lodz—did her family move from Vilno to Lodz? or did my great-grandfather travel to Vilno and meet her there? I have no idea what he did for a living, but I know he died before my grandmother and her mother came to the United States. Also of interest is that a city alderman (the equivalent of a city councilman today) was the person who married them. Does this indicate a certain kind of status for my grandfather or grandmother? Or had they done some sort of service that generated a certain amount of goodwill on the part of the alderman, Herman Bauler? Was he from their part of the world? When I looked up my other grandparents’ marriage certificate and license, I found more baffling information. There were actually two sets of licenses and certificates. On March 28, 1917, my grandparents were married at City Hall by a city clerk, with a witness whose name, Thomas Douglas, makes me think he was someone at City Hall, not someone my grandparents knew. But then, on May 25, 1917, there’s another license and certificate stating that Joseph S. Somerstein, a “reverend” (not a rabbi), married my grandparents at 611 East 6th Street, with two witnesses, Abraham Blaustein and Abraham Sternthal, whose names suggest they were friends of either grandfather or grandmother. Where I am free-lance copy editing now, there is a proliferation of “such as.” It’s as though all the editors at this magazine were taught by English teachers who’d been spooked. So today, I went to the basement, where I have all my teaching files, and found the clipping of the 1985 New York Times editorial on the subject. I e-mailed the top editors at the magazine I free-lance for and made my pitch to change some of those “such as”s to “like.” I await their verdict. Columbus Avenue. I had a podiatrist appointment about a mile away, so I decided to walk. After I got my book, I walked around the corner to 82nd Street, where Jack and I lived our first three years in New York. Our second apartment was at 134 West 82nd, a (very cheaply) renovated building—there were large gaps between the baseboards and the floor in places. We had mice. I got a cat from a “cat lady” (she had many in an apartment in Hell’s Kitchen), who turned out to be sick and we returned him. (Our cat-loving friends now would probably berate us for not taking him to the vet to cure him, but we were both working, and young, and careless.) An apartment in this building recently sold for three-quarters of a million dollars. welfare hotel. At night we sometimes heard screaming. The original Endicott had a glass-roofed Palm Court, and in that same space a series of restaurants in modern times; when we lived there, the space often held local CORE meetings. In photo to the right, the gray building in the background is now a police precinct, but when we lived there, it was a city-owned vacant lot; when it snowed, the city never cleared the sidewalk, and after several months of snow and melting snow, the pavement was broken in many places. The Fitbit I bought a couple of years ago is supposed to keep track of my sleep, as well as my steps. However, it has never worked properly. And it’s not just this one Fitbit. The first one I had was lost, and the second and third ones just stopped worked after several months. Not one of them has recorded the sleep that I know I’ve had or haven’t had. In other words, when I have actually been awake for an hour or more in the middle of the night, Fitbit thinks I was asleep, while it often shows gaps of one or two or more hours when I am pretty sure I was asleep. Here’s how off it can be. Last night I got into bed around 11:40, read for a while, and turned off the light just after midnight. Woke briefly just before 1 a.m., again at 3 a.m., and woke up for good at 8:45. Fitbit thinks I lay down at 11:24 p.m., shows a period of wakefulness for a while, then thinks I was up and about between 1:10 and 3:09 a.m. I feel like the device is gaslighting me. My doctor last week recommended another app, for my phone, called Sleep Cycle, and it looks much more accurate, showing me asleep between 1 and 3 a.m., including at least one period of deep sleep just before waking at 3, and then going back to sleep. Do you use any of these apps for monitoring steps and/or sleep? What’s your experience with them? I’m participating in the 12th annual Slice of Life Challenge over at Two Writing Teachers. This is day 1 of the 31-day challenge. It’s not too late to make space for daily writing in a community that is encouraging, enthusiastic, and eager to read what you have to slice about. Join in! ...which was last Thursday this year, or was it a week ago Wednesday, when Seattle beat Oakland in two official games—in Japan. The baseball season used to start on Monday, the first day of the week. Then ESPN came along, with its Sunday Night Baseball, and two teams would start their season the night before traditional Opening Day. And this day would be in April, unless it was in late March, when it was more likely to snow. 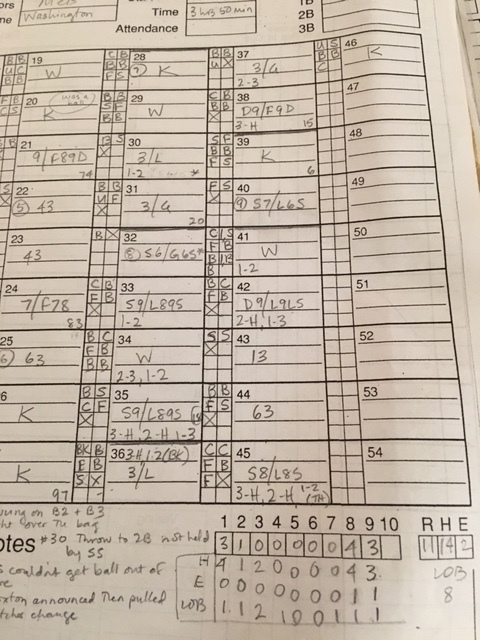 I like to score games when I watch, but I couldn’t watch the Mets’ Opening Day on Thursday because I had work to do. 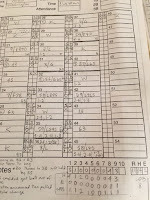 Today, however, I sat in front of the TV for the whole game, keeping score by a system devised by Bill James that is too complicated to describe here, but allows for keeping track of balls and strikes and makes it much easier to see who gets the RBIs. Here’s what it looks like. And hurrah, the Mets won, although they made it look harder than it should have. I love corn on the cob. I love cornbread. And I like polenta when I eat it in restaurants. However, my attempts to make it at home have been been very successful. First, there’s that stirring, stirring, stirring, as the cornmeal thickens in broth, much like risotto. So when I saw a recipe that said that long stirring process could be skipped, I thought it was time to try again. The idea was to bring broth to a boil, add the cornmeal slowly, and stir until it begins to thicken. Then pour into a greased baking pan, cover with foil, and bake for 40 minutes. I wasn’t sure I’d gotten all the lumps out in the stirring process, but popped the pan into the oven. Forty minutes later, when I removed the pan, it had sort of separated, with a thicker layer on the bottom, but a still liquid layer on top. Clearly, this wasn’t working out as expected. At least I need a better method for adding the cornmeal to the liquid. Fortunately, I had some leftover rice that I could use as a base for the vegetable topping I’d made (leek, onion, asparagus). About half an hour after eating, I saw that the polenta had solidified somewhat, but didn’t have much flavor. Alas, I sent it into the trash. Have you made polenta? Do you have any tricks? What exactly do you have against people with pre-existing conditions getting health insurance? Why are you so eager to take away health insurance from people who’ve gotten it through Obamacare, when they could not afford it before? Do you seriously think that suddenly insurance companies will stop denying insurance to people who have had cancer in the past, or some other disease the company doesn’t want to cover? You are heartless. No doubt he’ll never see this message, but underlings in the mailroom will, and possibly it will get to someone in Mulvaney’s office. It might make a few people stop and think about what is going on. As my cold lingers on, I feel less energy to cook my own food. Tonight I went out to a Dig Inn, a Northeast healthy chain of “fast food” restaurants whose food is supposed to come from local farms. There’s a cafeteria-style setup, where you choose a grain (brown rice or farro), two vegetable sides (hot or cold, including cauliflower, sweet potatoes, kale, mac ’n’ cheese), and a protein (grilled salmon or tofu, roast chicken, meatballs). “Why not?” I asked again. Maybe she couldn’t hear me because my voice is getting a bit hoarse. Did she make that up? Is that what her training told her to say if anyone was gauche enough to ask? I have not heard about any rash of counterfeit bills being passed in local restaurants. I’d have believed her if she’d said it was a security measure, to avoid robberies. What do you think about this turn to cashless business? to my chest and back and said my lungs sounded clear, I said I thought I could feel stuff rattling around. He then pulled up a diagram of the lungs on the computer screen (which has all of my information), to show me that what he meant by clear lungs referred to the branching bronchi and bronchioles, and that what I felt was most likely mucus in the trachea, which his stethescope wouldn’t pick up. Mucus in the bronchi and bronchioles could indicate pneumonia, so it’s good he didn’t hear that. Before the nurse drew blood, she asked if I was afraid of needles. “No,” I said, which is true, but it’s also true that I usually don’t watch when the blood starts flowing. Today, I did, and noticed how dark red it was. “No, blood has many different shades of red,” she said. “But I never thought about it,” she added. I have a bad cold, have had it since Monday. Cough, sore throat, the usual, no fever though. Thank you for small favors. It’s my first cold all winter, and it comes when it is officially spring, if still in the low 40s. I went to see Jordan Peele’s new movie, Us, which is a straight-up horror film. That did distract me for a while. But this is it for now. I’m going to bed soon. Yesterday I posted an experience of stubborn perseverance (redundancy?). Today I engaged in some stubbornness, then gave up. I got my cable/Internet bill today, with a welcome one-time rebate of about 40 percent and an offer of 3 free months of HBO or 6 free months of Showtime. It seems my cable/Internet provider has made a settlement with New York State because it didn’t provide the Internet speeds or coverage it had promised the state it would. I guess this is the company’s punishment, although I’d also like to have that Internet speed as well. The offer included a telephone number “to redeem your offer.” So I called. Of course, the phone was answered by a recording, and you’d think it would have been easy to program that recording to let me choose my HBO or Showtime channel. But no such luck. It took me a while to figure out what “problem” I had to tell the recording so it would connect me to the correct “representative.” I was on hold for maybe four or five minutes, but within a minute of a human being answering, my smartphone dropped the call. That just made me want to dial that number again. This time, I got past the recording more quickly, but that just put me into telephone hold musicland faster. And I was there for 30 minutes. Thirty minutes! I hung up because it was getting late and I had to eat dinner. Will I try again? Probably. Once I decide whether to go with HBO or Showtime. What’s your choice?